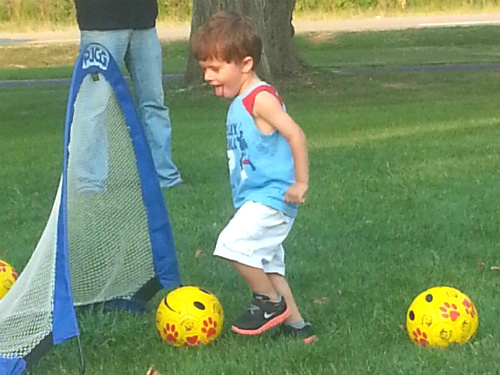 Carter has been getting his workouts in too! Over the last few months, Dan and I have been doing a lot of brainstorming about unfinished business. Once we have the cash for our boat, we want to be ready to go. That means taking classes and doing research like we talked about in Look It Up, fixing our current house to be ready to rent or sell, and working through the process of eliminating items in our house that we don’t plan on bringing with us and aren’t currently using. Another area that I was particularly concerned about was my personal level of fitness and more specifically strength. Basically my entire life, I have been abnormally weak. In high school, I literally failed the hand strength test in gym class. I have had to ask other women at work to open jars for me before. I certainly have never been able to help Dan move furniture or other heavy objects around our home. However, in my normal life, my lack of strength has never been more than a modest inconvenience. Someone stronger than I is pretty much always available to lend a hand. Not so in our new life. When we are on the ocean, the only hands available will be Dan’s and mine and to be perfectly honest that was a humbling realization for me. I need to be able to raise the mainsail, I need to be able to hold the wheel steady, and I need to have the strength to lift my husband or son out of the water or my weakness could become a life threatening issue for our family. I truly hope that Dan and I are never in a situation where one or both of our lives are dependent on the strength in my body, but I can’t consciously go into a life of such high potential danger without being better prepared. For the last three months, I have been using body weight workouts to increase my strength. We both decided that using these types of exercises (push-ups, pull-ups, squats, etc.) were our best choice since we didn’t want to spend a lot of money on equipment or gym memberships when we wouldn’t be able to use those things while cruising anyway. Even in this short amount of time, I’ve noticed a major difference in how I feel, how I look, and most of all, how much I can do. I wouldn’t go so far as to call myself a lean, mean, fighting machine, but at least I can open my own jars and pull off a few push-ups. I still have some way to go before I can beat Dan in an arm-wrestle. (Okay, let’s be real, chances of that happening are probably somewhere in the range of less than 1% and he would have to have mono or something.) The good news is that I have the right tools to get the job done and the confidence that I will be ready when my family needs me. NiaShanks.com This site is very strength focused and much more female-centric. I’m currently working through her Beautiful Badass Bodyweight Workout program. StrengthPLUS.ca Rebecca from ZerotoCruising.com has a site specifically dedicated to working out on-board. Over the last few months, several times Dan and I have brought up selling our GMC Jimmy and buying a vehicle with better gas mileage. Though we had only owned the Jimmy for a little over a year, we’ve had multiple repairs that we’ve had to make in addition to only getting around 15 mpg on average. We figured out that even though we only are planning to own our cars for one more year or so, there was still significant savings to be made so we starting searching for a reliable car with good gas mileage. We got a little help from the financial blogger Mr. Money Mustache who has a list that we used of the top rated small cars for reliability. 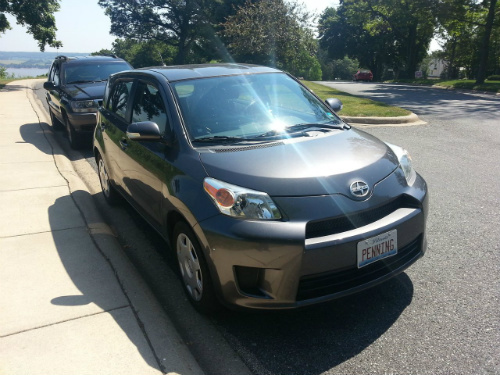 We quickly found that we really liked the look, efficiency, and pricing of the Scion xD and xA hatchbacks. These cars are stylish and fun while getting great gas mileage and having plenty of interior room for the three of us. (Note: they are still pretty small cars so anything more than 2 adults and 2 small kids is going to feel cramped.) We found an xD on craigslist only about 45 minutes from us and decided to check it out. How cool is that! Just in the course of a few minutes I got to hear about how this couple about our age are getting ready to head out on their own epic journey and follow their hearts off of the well worn path. Even though I could tell Becky was obviously nervous about telling us their plan (as I understand completely) I’m so glad she broke the ice. We were able to share some of our experiences in trying to plan for the unknown and made new friends. Most of all it was so encouraging to meet other people who share in common with us their belief that we are not prepared for our current life to continue on without change. Their journey will be very different from ours, but it comes from the same desire to live more extraordinary lives while we have the opportunity. We were happy to be able to help fund their goal in some small way by buying their car (which we love by the way) and if you would be interested in buying their house in Lincoln, Illinois here is the listing. We wish the best of luck to Kyle and Becky and hope that they see their dreams come to fruition very soon. Maybe if we make our way over to Belize in the next few years we will meet up with them again. 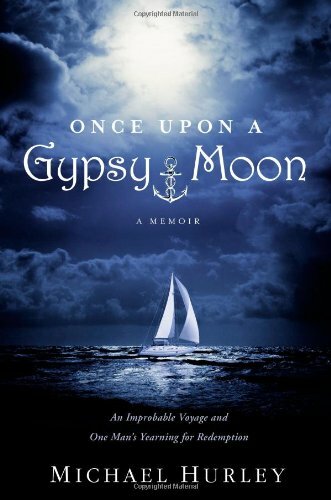 Once Upon a Gypsy Moon is not so much a sea-tale as it is a man’s introspective journey into his own motivations, actions, and dreams. While Gypsy Moon (his 32-foot sloop) carried Michael from Annapolis to Nassau and beyond physically, the time he spent single-handing her over that distance carried him much farther emotionally and spiritually. He started his journey lost and lonely after an ugly divorce and ended it as a man with hope for the future. The world has a way of working itself out, in my experience. There are things unseen. Life is not always easy or pleasant, and it is often unfair, but it seems to unfold according to some plan of which we are only peripherally aware – like a dream, the details of which are vivid only when we are sleeping. We cannot remember- much less comprehend- that dreamworld with the powers of a rational mind. Sailing has been a love of mine for almost as long as I can remember, and that love endures…But over the years, the idea of sailing long distances over oceans, unobliged to return, became for me less about adventure than escape- a kind of trapdoor beneath the uncertain footing of a marriage and a personal and professional life that seemed at various times to teeter on the brink of collapse… With no escape hatch, we have to face life head-on, admit our weakness, rely on our relationships, and trust others to catch us when we fall. The insight in the book was compelling, though at times it did get a little dry. The boat journey was somewhat less exciting than the cover lead me to believe as it was mostly individual legs of a trip broken up by repair stops on his old boat rather than a continuous time line. The final chapter entitled “The Loss of the Gypsy Moon” was certainly the most thrilling of the book as *Spoiler Alert* Michael did eventually have to abandon ship during bad weather after a nasty knock-down and subsequent rescue by the US Coast Guard. Maybe someday she will be found and resuscitated but it seemed a fitting end to the tale of a man who no longer needed his escape hatch. Each way gets you 1 entry into the drawing, for a maximum of 4 entries. We’ll do the drawing next Tuesday evening and announce the winner on the blog next week! Hope to see your name! I don’t think that smile could be any bigger. 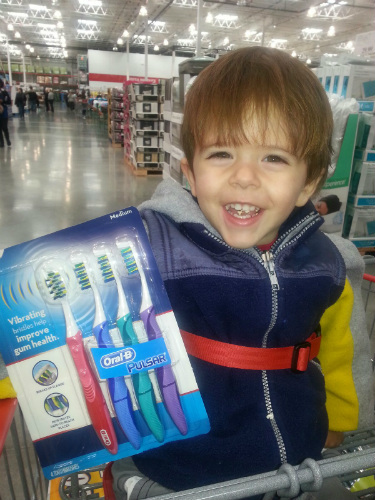 Our son Carter has had an obsession with toothbrushes since he was six months old. Not trucks, helicoptors, or trains…toothbrushes. He wants to hold them and brush his teeth, carry them around the house, and he knows exactly which brush belongs to which person. I don’t know how many times I’ve heard someone say, “That kid is going to be a dentist someday.” Being a dentist would certainly not be a bad career path for my son to aspire to in the future, but my real hope would be not just that Carter would find a profession he wanted to be, but find something he loves to do. I believe that our culture is a little too stuck on this idea of being. I am a Mom, Engineer, Waitress, Police Officer. I want to be a Ballerina, Teacher, or Baseball Player. What if instead of aspiring to be someone, we aspire to do something instead? What do you want to do? Teach, scuba dive, sail, help people, save lives, play baseball, dance…you name it. Now, instead of trying to fit your actions into your label, just forget the label and do the actions. When you are doing what you love, who you are to other people becomes a lot less important all of the sudden. That’s all nice and fluffy to think about, I know. What about food, and house payments, and my student loans to get that label, you say. Well, the beauty is that usually the people who are really loving what they do are the ones who are the most successful at it. And, unless what you want to do is own a fancy sports car and million dollar yacht, you probably need a lot less money than you think. So let me ask you, what do you want to do? Then go do it. Yea, it scares me too. For those of you following closely, you will know that LASIK eye surgery is on our To-Do List before we leave (aka lose insurance coverage.) Both of us currently wear glasses and contacts and while we understand that people certainly can go cruising with prescription lenses, we would prefer not to. Losing or damaging expensive glasses is an inconvenience when it’s a pair of sunglasses, its a danger when its a prescription that allows you to see anything farther away than the bow of your boat. The flip side of this coin is the fairly high cost. 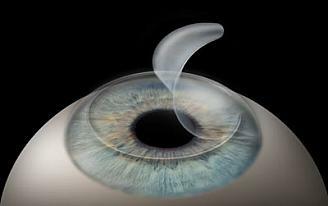 Eye surgery is considered an elective procedure by most insurance companies and is generally not covered. We’ve been quoted $1000-$2000 per eye depending on the type of lasers used and the warranties included. That’s a total cost for 4 eyes of up to $8000, a cost that will be coming directly out of our cruising kitty. Seeing as how we’ve moved up our planned departure date by a few years, that’s quite a chunk of change that has to be seriously considered. After a lot of consideration, (and some help from my parents’ insurance plan) we have decided to go through with the surgery. This Friday to be exact. Let me just say that it definitely does make both of us nervous. While LASIK is a very common surgery at this point, there are no true guarantees that something won’t go wrong. It is a little scary when going wrong could mean permanent damage to our vision. We’ll be heading up to Chicago for our surgery Thursday night for our appointments Friday morning. And if you think of us as you’re getting to work on Friday, send a little prayer our way. Hopefully, we’ll “see” you on the other side!